Kolkata: From Singur to Tollygunge—the hub of the Bengali film industry—it appears that something about West Bengal is coming to the fore: People in this state oppose development if they fear displacement. Two months ago, the West Bengal government struck a deal with Zee Entertainment Enterprises Ltd to lease out a state-owned film studio—Technicians’ Studio—for Rs40 crore. Zee, which was the only bidder for Technicians’, would pay the amount over 10 years for the 99-year lease. Under the agreement, it was to build six state-of-the-art shooting floors and a multiplex and condominiums for visiting technicians and actors at an estimated cost of Rs200 crore. “It is not clear to us what these people (film makers and technicians) want. Now, they are saying the heritage character of the place has to be maintained. The way things are going, post-Singur, it seems nothing will materialize," said Dilip Chakrabarty, principal secretary of the state’s information and cultural affairs department. Chakrabarty is referring to protests and violence in Singur that led Tata Motors Ltd to say last week that it was pulling its Tata Nano small car factory out of the state even though the facility was almost complete. Tata Motors is now being wooed by several states, including Gujarat, Karnataka and Andhra Pradesh, all offering tax and land deals for the factory that would make the world’s cheapest car, expected to sell for Rs1 lakh or so. According to film maker Goutam Ghose, the Tollygunge resistance stems from “genuine concern for the Bengali film industry". “Modernization (of Technicians’) can happen, but the interests of the industry should be protected," said Ghose. People fear the revamped floors will be reserved for Zee’s own productions, and even if they are rented out, they will cost more, according to Aninda Banerjee, a maker of television serials. “From Rs5,000 a day, rent will shoot up to Rs25,000 or more," said Banerjee. People in Tollygunge make films with small budgets. On an average, Bengali films cost around Rs1 crore, but a lot of films are made with as little as Rs35-40 lakh as well. “Transfer of Technicians’ (to Zee) could kill all these small budget films, which cannot afford to hire costly floors," said Arijit Dutta, managing director of Priya Entertainments Pvt. Ltd—a company that produces and distributes films. Producers don’t stake big amounts on Bengali films because they don’t do well at multiplexes. Even glitzy potboilers shot in exotic locations such as Salzburg in Austria and aimed at a young urban audience don’t sell in multiplexes beyond a week or two. “It’s not that Bengali films do not have an urban audience, but they just don’t do well at multiplexes. I think it’s a culture problem, and it’s a problem for almost all regional films, not just Bengali films," said Dutta, whose company runs a string of profitable single-screen theatres in Kolkata. The state government has been doing its bit to support the production of Bengali films. 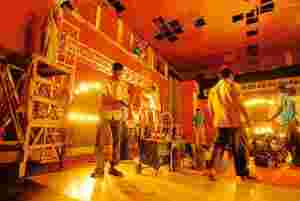 It offers cheap infrastructure and even a subsidy of Rs3.5 lakh to each film processed at its Rupayan laboratory in Kolkata. “Film makers still go to Orissa and Chennai to process films these days," said Dutta, admitting that government-owned Rupayan and Technicians’ should be revamped. But he is opposed to the entry of corporate houses such as Zee because he is “sceptical about their responsibility to regional films". At the premiere of a Bengali film on Friday, Dutta and a number of leading actors launched a scathing attack on the government’s plans to lease out Technicians’ to Zee and sell the loss-making Rupayan laboratory. Such events are being routinely used by film makers and technicians to garner support for their movement against the state government’s plans to pass on the reins of Tollygunge to corporate players such as Zee. While producers and filmmakers are worried that production costs will go up, technicians are worried they will lose their jobs. The studio has some 32 employees on its rolls, and they want a commitment from Zee that they will not be sacked. At least 100 more mill around the studio every day, doing a wide variety of jobs and earning Rs250-3,000 a day. Many of these technicians have turned parts of the studio into unauthorized dwelling units, and though the government ordered them to leave almost a year ago, they haven’t moved and are demanding rehabilitation. Amid the brouhaha, Zee says it respects the concerns of the film industry, but remains non-committal about its plans for the run-down studio, where many a celebrated film, such as Satyajit Ray’s Pather Panchali, has been shot. “We are committed to the growth of the Bengali film and television industry," said Rajib Chatterjee, senior vice-president and business head of Zee Bangla, but refused to elaborate.